We have changed the way we sell uniform. All uniform for Year 7 and 8 students is only available from our suppliers Stitch a Logo. Items for Years 9 to 11 will continue to be available from the school until stocks are exhausted, and for these students the usual uniform requirements and expectations will apply. We have also made some changes to the uniform itself. Our PE kit has been revamped and extended. This new-style kit is compulsory for our Year 7 and 8s and is only available from Stitch a Logo. Parents of students in Years 9 to 11 may buy the new-style kit if they wish, but this is not compulsory and we anticipate that most will continue to buy existing PE kit from the school while stocks last. At Harrow Way we are very proud of our school uniform, which is an essential part of our school’s ethos. 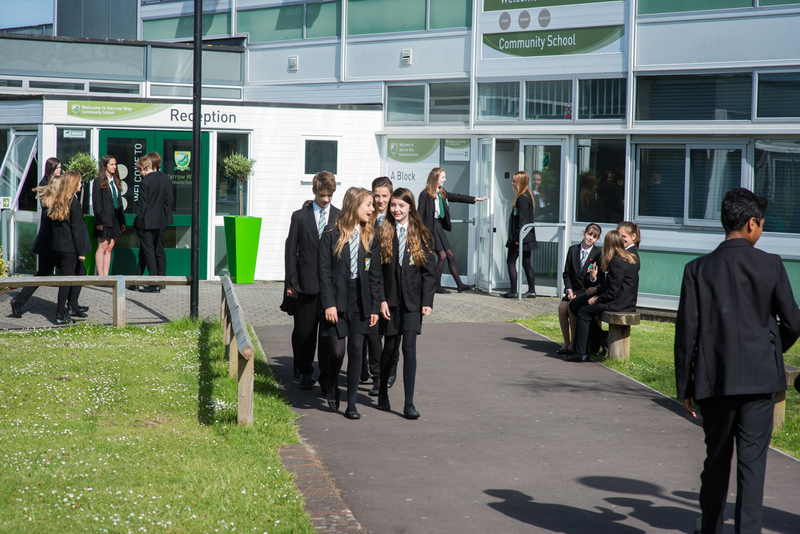 We believe that a smart uniform improves our students’ self-esteem and confidence and contributes to good behaviour, as well as helping them to feel part of their school community. As our uniform is compulsory, we must ensure that schoolwear bought in local stores is consistent with uniform policy. This is not always easy to achieve, as these stores sell a wide variety of clothing styles labelled as ‘school uniform’. The fabric and styling of ‘school trousers’, in particular, differ widely depending on where parents shop. TIES must be worn properly tied, with the top shirt button fastened. SHIRTS must be white and worn tucked in, with the top button fastened. TROUSERS are permitted for girls and boys but must be plain, black trousers in a classic style – that is, not shaped to hug the legs. They must not be denim or leather, or casual in style. Combat trousers, leggings and jeans are not acceptable. SOCKS worn with trousers should be plain black. SKIRTS for Years 9 to 11 must be plain and black, unless students are wearing the new-style tartan skirt from Stitch a Logo. Skirts must also be of an appropriate length to preserve decency. A guide for appropriate skirt length is that it should be no shorter than one hands width above the knee. Lycra fashion skirts are not permitted. TIGHTS must also be plain, and either natural or black. SHOES must be black, plain and flat, and should be worn to and from school. Trainers must not be worn except for PE/Games lessons and for permitted sporting activities. GREY, BADGED JUMPERS are available for the first time this year, as an optional additional item. Students who wear these, however, must do so IN ADDITION to their blazer, NOT instead. No denim or leather clothing is permitted. PE KIT. For all games and PE activities, the school’s PE kit must be worn. For Years 7 and 8, only the new-style PE overtops from Stitch a Logo may be worn outdoors for PE in cold weather. 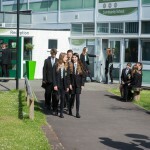 All other year groups may continue to wear their existing multi-sports tops or girls’ badged fleece tops outdoors for PE, and may continue to purchase replacement items from the Uniform Office until stocks are exhausted – after which they will need to buy new-style tops from Stitch a Logo. No alternative outdoor tops may be worn. All students may wear plain black tracksuit bottoms for PE in cold weather. Gum shields are strongly recommended for hockey and rugby activities. For all PE and games activities, students with long hair must provide themselves with hair ties or clips to keep hair off the face. OUTSIDE COATS should be plain and muted, with minimal or no logos. Denim and leather outside coats must not be worn. SCARVES, if worn, should preferably be black. GREEN APRONS for Food Technology are compulsory for the lower years. JEWELLERY. The wearing of jewellery, with the exception of watches and a small ear stud, no more than one per ear, is not permitted. Other visible piercings are not permitted. MAKE-UP Too much make-up is inappropriate and in these cases the student will be asked to remove it. Only clear nail varnish may be worn. NO HOODIES or BASEBALL CAPS are permitted. HAIR. Extreme styles and colours are not acceptable. Trousers for both genders may be straight-legged or slightly flared, but MUST NOT be leggings or ‘skinny leg’ trousers shaped to hug or cling to the legs.